GUMNUTS.....AND OTHER STUFF: South Coast to the Snowy Mountains. Day 3. ( Saturday 8th February). South Coast to the Snowy Mountains. Day 3. ( Saturday 8th February). Up with the sun (well one of was) to try and get away a little earlier today, but first a look around Eden. Lookout Point, the wharves, George Bass Lookout, Curalo Lagoon Boardwalk then off to Red Point for Boyd's Tower and after morning tea to Davidson Whaling Station. It was then across to the Monaro Hwy via Imlay Rd to Bombala. Turn left after Bombala on the Snowy River Way to Jindabyne, where we planned to stay the night, via Jincumbilly and Dalgety. Arrived in Jindabyne in daylight (still very warm at 35C) and booked into the Motel with about 10 motor bikes at neighbours. Still working on Day 4 and Day 5. Click on 'Older Posts' at bottom of page to go to Day 1 (first day). A new day dawns over Two Fold Bay, Eden. A Koel is silhouetted against a golden sky. It's starting to warm up already. Watching the Rubicon returning to the Eden wharves in Snug Cove. When boats were made of wood, men were made of steel. Fishing fleet in Snug Cove, Eden. Fresh Fish Headed for Sydney. A Large Black Cormorant hoping for some scraps from the fishing trawlers. None to be seen from George Bass Park Lookout, Eden. 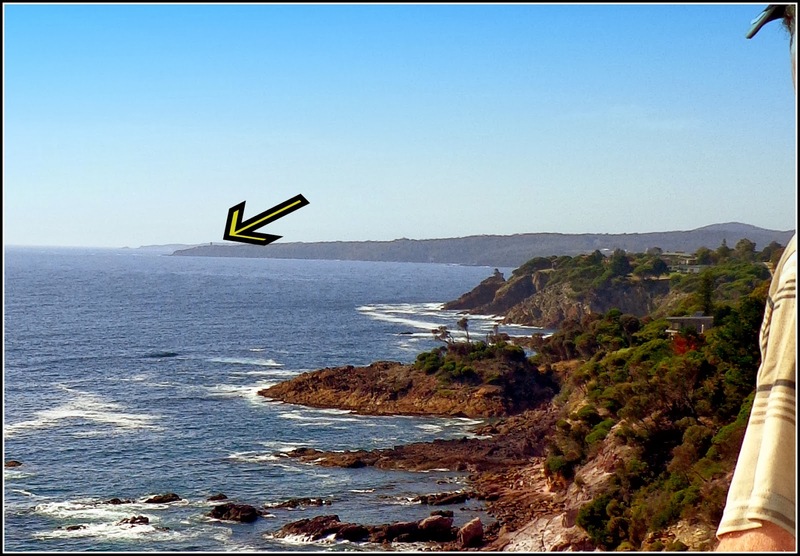 That little blob on the point is Boyd's Tower. Looking north over Aslings Beach from George Bass Park Lookout. Boardwalk at Curaio Lagoon, Eden. 'The spectacular sight of these folded rocks is rivalled by their impressive 360,000,000 year history of primeval plants, fishes and volcanoes'. Bending Rocks and red cliffs at Red Point. Looking back across to Eden in the far distance. Walking back up from the red cliffs. Feral deer crossing the road on the way to the old Davidson Whaling Station. Boardwalk to the old whaling station. 'The cottage, Loch Garra, built in 1896, was home to George and Sara Davidson through to the 1940's. With 17 acres of land they were largely self-sufficient in fruit, meat, vegetables and dairy products. These resources helped through the periods when whales were scarce' (edited). Site of the Davidson Whaling Station. It was only a small station. Last used in 1929, the try-works fell into disrepair throughout the years leading up to World War II, today little remains. A lot of carnage in such a picturesque setting (today). A Goanna returns from patrolling the beach for scraps. There were a lot of Mutton Bird carcases on the beach to choose from. We have now left the coast and heading toward Jindabyne. Morning tea stop at the White Rock Picnic Area. Lynn didn't like the 37 C (99 F) temperature and was glad to get back into the air-conditioned chariot. Cool reflection in the creek. These Yellow-tufted Honey Eaters were also heading to the creek for some refreshment. Skyline at Rock Flat Creek. It's always good to know where you are and have passed half way, well I suppose it all depends in which way you are headed. Olympia Theatre Facade 1920, Bombala. Imperial (there's an old word boys and girls) Hotel, Bombala. 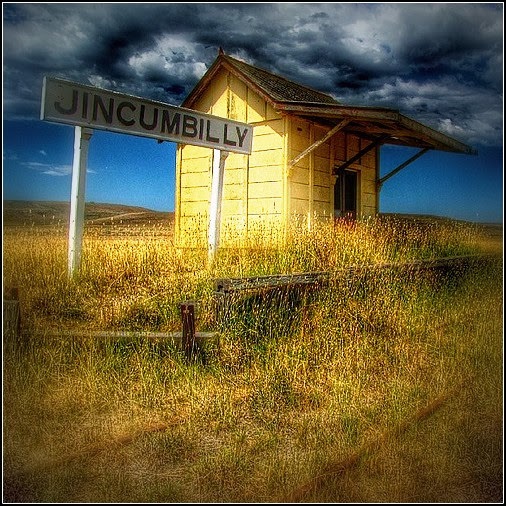 Jincumbilly Railway Station. You would have a very long wait for a train. They have found a use for some of the old railway track, Jincumbilly. A typical old oil drum mail box in rural Australia. There's a lot to photograph out here. Somewhere along the Snowy River Way. The Snowy River Way winds its way to the mountains, way, way in the distance. Wish I had a Ferrari. Narrow bridge over the Snowy River at Dalgety. Local kids cooling off in the Snowy River, Dalgety. Well, it was 38C (just over 100F) by now. Lake Jindabyne from our Motel (Lake Jindabyne Hotel Motel). Pathway runs below Motel along the lake edge. Kids in inflatable being towed behind a speed boat. Making the most of what daylight is left. .........and a good night starts. The Riverboat Postman - Hawkesbury River.